A rancid Knocked Up knockoff in giddy romantic comedy clothing, My Best Friend’s Girl continues this trend in both movies and election season politics of degrading high achiever women potentially upstaging men. There’s also plenty of cheap imitation Juno style spiced up dialogue with occasional bite, especially one outrageous detour into a Jesus pizza parlor. But more often than not, the tone is sheer stomach-churner vibes in reaction to just how low director Howard Deutch (Pretty In Pink) will go to lavish leading man finesse on a scuzzy boorish male. Dane Cook seems to be nearly wincing through his less gag than gag-inducing lines as Tank, a sleazy womanizer with a bottom feeder gig as a call center phone operator hustling shoddy air purifiers by day, and spouting hot air on his down time to lure gullible women into bed. In fact, he’s gotten to be such an expert at manipulating women, that Tank has concocted a lucrative money-making moonlighting scheme, having to do with guy rejects paying him to date their indifferent female objects of desire and act so vulgar, that these unsubmissive babes learn to appreciate the men they rebuffed in the first place. 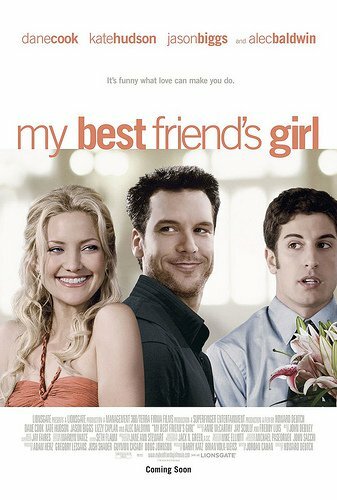 That is, until his best friend and roommate, nerdy Justin (Jason Biggs) seeks Tank’s services to simultaneously woo and disgust the hottie lawyer Alexis (Kate Hudson) who works in his office. Alexis has been dating Justin but strictly at arm’s length, because he doesn’t particularly turn her on. But when Dane worms his way into her life, Alexis suddenly can’t get enough of all the crude sexual insults this male pig – without lipstick – is dispensing as effective foreplay. The matter of what was Kate Hudson thinking, while so utterly demeaning herself in a move, is the least of it. Sorry, Dane Cook is no Brad Pitt to begin with. And what this procession of glamorous women see in the crass creep, while succumbing to his extreme dirty talk as the ultimate aphrodisiac, finally makes My Best Friend’s Girl more of a mystery than a romantic comedy.